We rose from the ashes... blood and a whole lot of tears to find LOVE! NYC, 2008; I found myself sitting on my Upper East Side front stoop, in tears, feeling so very left behind, and wondering what the point of it all was. I had just got off a call, where I was informed of my exclusion from our annual friends ski trip, because it was now a 'couples thing'. OOOOOF! Right in the stomach! My friends, all recently into new relationships, thought they were saving me from an awkward week of being the 7th wheel. All I felt was this absolute confirmation, that I was less than whole for being single AND that I was now firmly running way behind the pack. That they were somehow moving on, and I felt so very stuck. It hurt, and triggered something right to my core. There I was, strong woman, super successful in my career, a great social life by most standards, living in one of the greatest cities in the world, and feeling so alone and lost. testTHATlower2, I was str8 losing the plot, on my East 87th street building stairs! I was so far away from my hearts desire, of love and partnership, I might as well have been on the other side of the galaxy. WHY COULDN'T I SEEM TO SORT THIS AREA OUT? Hitting rock bottom in dating, saved my love life. And a coach, turned my life, right side round. Waving a white flag and finally asking for help in the arena of love, literally saved my sanity. It empowered me to a level of wonder womaness that I didn't know was possible, and didn't really know was missing! My self esteem, SOARED! My Confidence BLOSSOMED! And my tolerance for BS in every area of my life, dropped as I learned how to boundary like a boss, and really have my voice heard! Oh, It also netted me the most extraordinary partnership with a truly wonderful human being, who is so very worthy and able of building a life beyond my wildest dreams with! Darlin' It ran so much deeper than just getting on on dates. So much deeper than all the 'drive them crazy for you' tomfoolery I was reading about online. And it was so not about learning the secret location to the bat cave where all the good men were hiding! It wasn't easy. It wasn't pretty on some days. But that worthy work, was one of the best decisions and investments in me, I've ever made. So much so, they wanted to share their experience, with other women, like YOU! And the lovely superstar, Ruth! 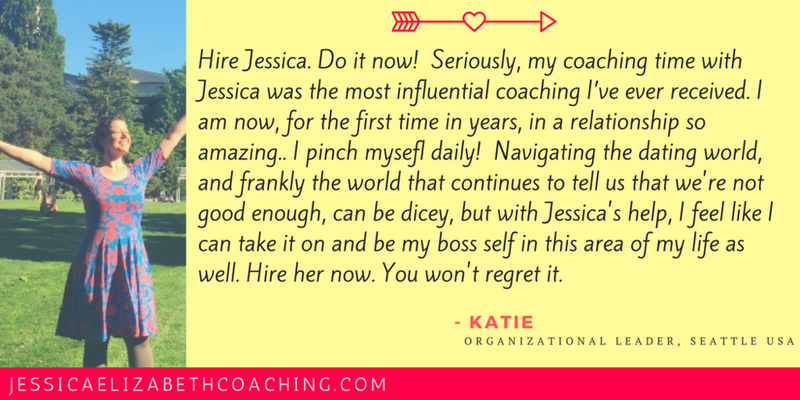 I am filled with such incredible gratitude when I receive these powerful testimonials from my clients. My heart just swells up against my rib cage with joy! That I have been able to help them facilitate tangible change in their love lives, AND short circuited the process that took me years AND years of blood, sweat and a whole lotta tears to figure out, simply because I was so convinced, I had to figure this out all on my own! I look back now, and I realize how crazy pants that was... and how I wouldn't and didn't hesitate to ask for help AND invest time, money and energy in my career, education, social life, heck even my travels... to get the results I wanted! I hate to get all bragalicious over here, however one of my superpowers?? I have the actual mileage of working with incredible women and getting them results they never knew possible. The proof is indeed in the pudding ya'll! Can we real talk for a moment here? There are a lot of folks out there who use the term 'expert' and claim they will help you attract the love of your life in 6 days (?!?!)... I'm not one to mince words, so let me boldly call BULLSH%T! on all that snake oil shizzle! Transforming how we seek, attract, give and receive love is truly epic and worthy work, that takes time and a whole lotta heart! Both of which I have no doubt, you have in spades, dearest one! Before I leave you today, I want to let you know, my Spring 2018 Private 1-2-1 Coaching Programs are almost filled to the brim, with just 3 spaces remaining! If you are serious about revolutionizing your love life, stopping the endless going no where messaging of online dating and start getting out on to real 3d dates, with real 3d people in the real 3d world, the simple truth is, I CAN HELP! 2018 is cruising at top speed, and if you're not getting anywhere closer to finding that extraordinary partner to share your life with, let's get on the phone and have a chat! FOR FREE! I am offering up a my signature FREE 45 minute Breakthrough To Love Call today, so you and I can get right down to it, and start sorting it! Let's go on a first date, lady! BOOK YOUR CALL! Newer PostYou've just been GHOSTED, again... BOO! Older PostI found THE BIGGEST KEY SECRET to relationship happiness! !